To learn more, check out our financial analysis fundamentals course. For example, a company sells 10,000 shoes for total revenue of $500,000 with the cost of good sold of $250,000, and shipping & labor expense of $200,000. 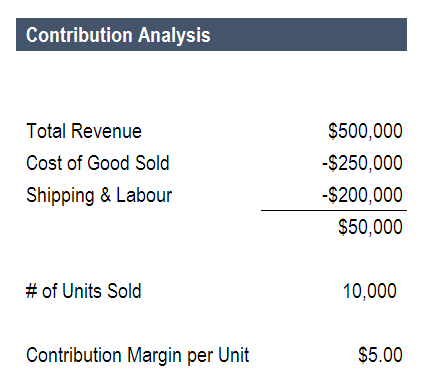 Contribution analysis helps in the assessment of how individual products are profitable to the company. The significance of contribution analysis is that it gives certainty to the profitability of each product and makes you understand why the results are so. Contribution analysis clearly provides the specific external and internal factors that have an influence on a company’s income. Identify the problem to be assessed – This means pointing out the target that you want to see the cost/profit analysis on. Come up with a change theory and model – This means that you should come up with relevant policies with respect to the problem identified. This will help in understanding how the policies formulated going to help in influencing change. Gather enough data on the model – It is important to get the existing evidence on the model formulated to ensure that it will be effective. Dig up additional evidence – This is the stage where new data and evidence is added to the already existing information so that nothing is missed. Revising the performance data and records – This process will help in the rectification of the weaknesses and improvement of the strengths. To learn more, see the resources listed below and check out our financial analysis fundamentals course.